Motorcycle Accidents Caused by Defective Bike Parts | Johnson & Gilbert, P. A. How can I tell if my motorcycle crash was caused by a defective part? While the majority of motorcycle accidents involve a collision between a biker and a car, many motorcyclists are injured each year as a result of defective bike parts. When improper installation or poor quality products can cause a motorcyclist to veer off of the road, lose traction, or strike another road user, he or she may be able to pursue a claim against the manufacturer. Who's Liable When Motorcycle Defects Cause a Crash? Defective motorcycle parts may be the cause of accidents with other vehicles as well as no-contact crashes, and often happen without warning. Although motorcyclists aren't at fault for these accidents, they're responsible for proving that a manufacturer was negligent, which can be difficult for someone recovering from a severe injury. Manufacturer defects. A legal claim may be brought against the manufacturer of the bike itself or the maker of any aftermarket or replacement parts installed on the bike that were used according to manufacturer instructions. These are called product liability claims, and can include steering mechanisms, brake lines, transmissions, fuel systems, or even the overall design of the bike itself. A manufacturer can also be liable if the company failed to adequately warn riders about the potential for danger. Maintenance errors. In some cases, a repair shop may be to blame for installing the wrong item or failing to adequately complete maintenance. Malfunctioning brakes, throttles, tires, mirrors, or any other part of the machine can all increase the chances of an accident and compromise safety in the event of a crash. Lost evidence. Product liability claims rely on a thorough investigation of accident scene and the damaged motorcycle. Unfortunately, evidence at the scene is often lost during roadway cleanup, and more is lost to the elements with each passing day. 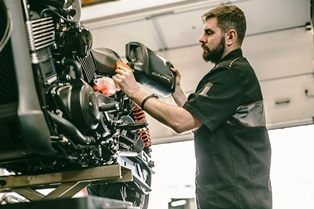 In addition, riders who are eager to get back on the road may begin repairs on their bikes immediately, destroying even more vital evidence in the case. There are many parties that may be held liable in your product liability claim, including the distributor of a faulty part and the dealership that sold the bike. If someone else’s negligence resulted in your suffering, we can help you collect the compensation you deserve. Simply fill out the form on this page today to schedule your free case evaluation with one of our experienced injury attorneys. Can I Sue the Driver If I Didn’t Have Motorcycle Insurance? ?How soon after a crash should I talk to a motorcycle accident attorney? ?What are the simplest ways to protect myself from a motorcycle accident? ?How can I find motorcycle safety courses in my area?